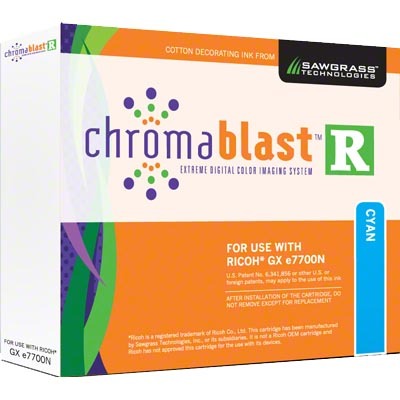 The Ricoh GX e7700N for ChromaBlast-R digital garment printing system is the printer of choice for fast-growing shops who require the highest level of reliability and durability to meet their production demands. ChromaBlast-R is a specially formulated cotton transfer ink for the Ricoh platform and makes a great alternative to expensive direct to garment systems. Paired with ChromaBlast Transfer Media, ChromaBlast-R produces vibrant, lasting images on white and light colored cotton fabrics that look, feel and breathe like nothing else on the market. Capable of printing large images at a rate of up to 138 color prints per hour, the Ricoh GX e7700N is the perfect high production cotton transfer printing system. 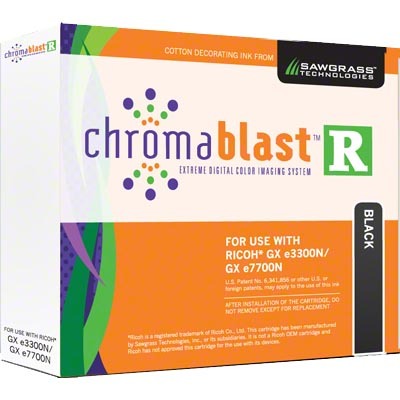 ChromaBlast-R’s high-capacity ink cartridges provide extended uninterrupted printing without the need for a separate bulk ink system. 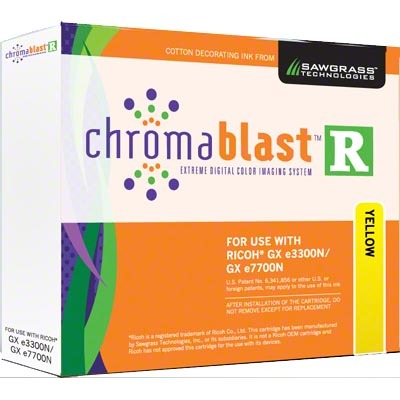 Yellow Chromablast-R™ Ink Cartridge, 29ml, for the Ricoh® e3300N or e7700N printers. Reliable, High-Yield Gel-based Ink Formulation Inks by Sawgrass®. The ink collector for E3300N and E7700N printers is 405700, sold separately. Magenta Chromablast-R™ Ink Cartridge, 29ml, for the Ricoh® e3300N or e7700N printers. High-capacity cartridges - for extended, uninterrupted printing. The ink collector for the E3300N and E7700N printers is 405700, sold separately.